The advertising business is barely recognizable from just three years ago. Of the top five agencies in 2015, only one was still top five last year and that one had half the revenue in 2017 it earned ten years ago. The need to connect on an emotional level with customers through traditional ads will always be with us. But to most CMO’s, personalization across multiple channels is the job that needs to be done. Traditional agencies’ forte—the emotional TV ad—is no longer paramount. For many CMO’s the first job-to-be-done is to figure out what jobs need to be done. 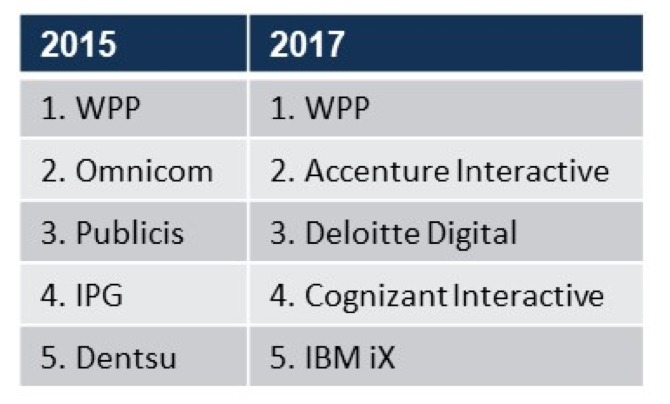 No wonder AdAge lists Accenture, Deloitte, Cognizant Interactive, and IBM—consulting firms that have acquired numerous ad agencies—as among the five largest ad agencies. So, the process of choosing an ad agency has changed from even ten years ago. Gone are the days of agency teams dazzling prospective clients with big idea shows—each more creative than the last. Marketing is no longer “selling products and services to buyers.” Marketing in the digital age has become a conversation between producers and consumers—and the consumer is in charge. Choosing an agency must be exactly this kind of conversation between the CMO and potential marketing partners. Yes, the potential marketing partner comes in with a story to tell about their capabilities—MarTech based personalization; a superior Digital Network; perfecting the customer experiences across the customer journey; and optimizing the thousands of impressions your customer contact people make every hour; etc. But when they are celebrating their achievements and you say to them they are not addressing your job-to-be-done, do they stop, listen, and pivot to address your stated need? Or when they are presenting five areas of capability and you stop them and say it’s numbers two and four you are interested in, do they stop, listen, and pivot to focus on numbers two and four? Do they listen, or are they still in the world of pitching what they do, showing off their awards, and their marquee clients? If they are still in the world of “dazzle, pitch, and close,” thank them for an entertaining hour, and send them on their way. They won’t be the partner you need to help co-create an effective marketing strategy and multi-channel activations. ASK: Does your agency apply jobs-to-be done theory to marketing? If they listen and respond to you with creative insights—if you are having a real conversation and you find their contributions full of valuable ideas that push your thinking forward—they are a candidate to become your marketing partner. The meeting is more like a job interview than a vendor selection. A partner will be focused on the outcomes for your business and your customers. A true partner understands that prioritizing customer needs over your need to sell products and services often requires a significant culture change in all areas of your organization. ASK: Is the agency focused on outcomes? Will your team have the right talent available? Yes, every agency has luminaries who they can bring to your meeting in hopes of winning your relationship. But will the luminary spend a significant amount of time on your account? Unless you are in the Fortune 100, probably not. You need to evaluate the team that will be assigned to you. Sense where a prospect is in their journey and respond differently to say, browsers, shoppers and buyers? Analyze past interactions with the prospect and other customers with similar experience patterns to personalize messages and responses? Prepare creative responses to each stage in the journey that includes information the prospect will value? Measure results, analyze them, and improve your models for the next round of customer communications? Each part of the digital network—customer analysis and modeling, customer journey mapping, the design of creative and effective responses to customers at each stage in the journey, measurement, learning, and so forth—is technically deep. It will be virtually impossible to evaluate your agency team’s chops in each part of the digital network. So, you may be reduced to judging whether all team members are tech savvy, energized, creative and cheerful. ASK: Who will work on our project? Who are the key members of the team? It would be a good idea to visit your team in their home office and get a sense for the firm’s culture that your team members will be working in. It certainly must be diverse. Look for signs that the culture nurtures individuality and invites non-conformity. Talent rules. The most critical decision in any review is getting a measure of the agency talent. Agencies that are brave, culturally diverse and committed to self-expression create better, more forward-thinking teams. Find out what kind of people they hire. Are they ambitious? Inspired? Make sure that the talent is technologically literate. Ask to see the agency’s turnover rate. Spend time with HR and find out how the agency hires, promotes and rewards its talent. ASK: What are some non-traditional ideas that have worked with other customers? At one time you would have wanted an agency that was in your geographic location and which was about the same size as your company. Web-meetings and file-sharing have made geography much less relevant today. But matching size may still be important: If you are a $500 million firm, you are in Bain’s sweet spot, a little small for BCG or McKinsey. Deloitte and IBM will have business units devoted to your size company, but there will be several mid-sized firms for whom your company will be the crown jewel in their portfolio. ASK: Who else have you worked with that had problems similar to ours? Global organizations have always had multiple agencies. Some even used agency-rivalry as a management tool. But today every organization may need more than one agency. Today it’s not agency-rivalry that calls for different agencies, it’s that the skills needed to optimize customer experiences across the customer journey are very different from personalized communication programs. Again, the clearer the focus on the jobs to be done, the easier it will be for you to select exactly the right partner for you in accomplishing that job. ASK: Who do you partner with to bring us the best outcomes? For those of us who rose through the corporate ladder by convincing customers to buy our products, it can be hard to remember that those skills are largely obsolete. We live in a world where the customer is in charge, and we need to be skilled in listening and responding in ways that the customer finds valuable and helpful. It is like playing tennis and it is always the customer’s serve. Select an agency that will be a great doubles partner. A partner that truly understands the CMO’s job. ASK: What does customer centricity mean today? How do you suggest we get closer our customers?